Cancer is one of the most feared diseases on the planet. This is because of the limited treatments available, the nature of the treatments and the uncertain progression of the disease. Cancer involves the cell growth that has gone hay-wire. It gets out of control and the dividing cells begin to invade the surrounding tissues. This leads to the growth of tumors and the normal cell cycle associated with the renewing of the old cells deteriorates. Once these cells and tumors travel to other parts of the body, they may influence the other tissues of the body as well. This condition, where healthy tissues are destroyed, is very difficult to treat. Chemotherapy and radiation therapy can be done, but each has their own side effects. Cancer can be of various types, such as cervical cancer, breast cancer, bone cancer, blood cancer and so on. The treatments in such cases also have an alternative treatment, in case patients wish to avoid the conventional treatments. Cancer can also be prevented from arising as well as progressing. This is done with the help of wheatgrass. Wheatgrass is made from the cotyledons of the wheat plant, or Triticum aestivum. It is gluten-free and is nowadays available in a variety of forms including pills, capsules, tablets, juice and powder. There are a number of benefits which can be derived from wheatgrass. It contains chlorophyll which has the ability to cleanse tissues, remove wastes from them, replenishes red blood cells, neutralizes toxins and also regulates blood sugar levels. It contains Vitamins K, E, B,C as well as A and minerals such as magnesium, sodium, zinc, potassium and also calcium. It can aid cancer patients, or those taking preventive measures against cancer in many ways. Wheatgrass has been considered as an anti-cancer, antitumour agent which is capable of induction of apoptosis. It also prevents the harmful effects of chemotherapy from affecting patients. Not many side effects of wheatgrass have been reported, however, some patients may have difficulty tolerating it. An investigation was carried out to test the cytotoxicity of wheatgrass against various cancerous cell lines. Normal blood cell culture was used for this purpose. Wheatgrass was found to be effective against human acute promyelocytic leukemia cells (HL60) and proved that for necrosis can also replace apoptosis in order for cell death to take place. Methylphophorbidea (MPa) is a component of wheatgrass and has been known widely for its effects against oxidative stress. It has been shown that as the concentration of this compound increases, the survivability of cancerous cells decreases. It hence enables wheatgrass plant to be used against cancers. Wheatgrass helps in getting rid of cancer cells and a compound known as Methylphophorbide a (MPa), present in wheatgrass decreases the survivability of the cancer cells. Treating cancer comes at a cost. There are a number of side effects associated with chemotherapy, such as vomiting, diarrhea and nausea. The drugs have the capacity of affecting cells present in the digestive tract. It can also suppress bone marrow. However, wheatgrass can help with this issue. Myelotoxicity is the suppression of bone marrow production. It is a very dangerous aspect of chemotherapy and can also be life-threatening. Wheatgrass juice, when used along with chemotherapy can help reduce the myelotoxicity. Patients undergoing chemotherapy for bone carcinoma were administered with wheatgrass juice for the first three cycles of chemotherapy. There were minimal side effects associated with its consumption, however, some patients complained of the worsening of nausea. Wheatgrass juice decreased the myelotoxixity. 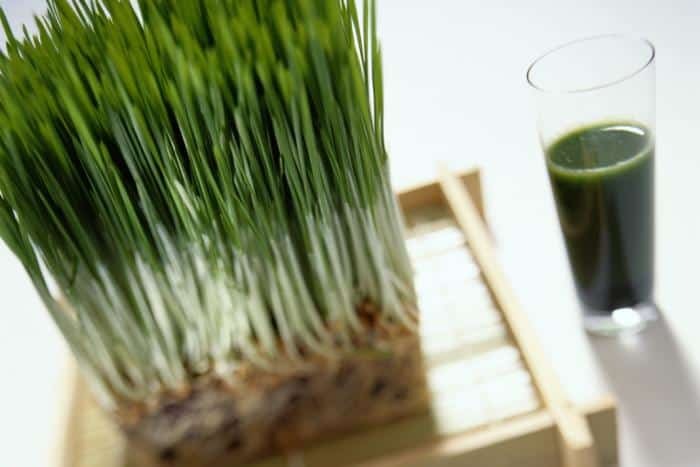 An 89-year-old patient suffering from primary peritoneal cancer also chose wheatgrass instead of chemotherapy. After 4 years of it’s consumption, the results were positive. Wheatgrass can reduce myelotoxicity caused by chemotherapy and is can be considered for investigation as an alternative to chemotherapy. Since wheatgrass contains vitamins, minerals, over 30 enzymes and chlorophyll, it is capable of removing toxins from the cells, restoring balance, and building blood. Due to such properties, it was tested if it could improve the quality of life of terminally ill cancer patients. Sometimes, blood transfusions are required for cancer patients. Sometimes, surgeries are carried out that lead to blood loss and blood loss may also be a result of chemotherapy. According to a study published in the Journal of Clinical Oncology in the year 2006, solid organ cancer patients were selected and the effect of wheatgrass juice on serum protein, haemoglobin level and performance status of the patients was seen. For this purpose, fresh wheatgrass juice (30mL) was given to the patients over a period of 6 months. The values of total protein, albumin and haemoglobin were improved significantly, so was the performance status. Wheatgrass juice can be successfully used as an alternative to blood transfusion in case of terminally ill cancer patients. Chlorophyll is one of the most important components of the plant kingdom. Having an almost similar structure to haemoglobin, it is also called the “blood of plant life”. It can cleanse the system of toxins and improve the supply of oxygen. It also nourishes the kidneys, liver and also restores vitality. Chlorophyll also has activity against cancer. The derivatives of chlorophyll have antimutagenic effect as well as tumoricidal potencies. The derivatives with maximum impact on myeloma cell multiplicity were pheophytin and pheophorbide. Hence, foods with chlorophyll are capable of preventing cancer, such as wheatgrass. Animal studies were also used to deduce the fact the chlorophyll works against cancer. The derivatives of chlorophyll (chlorins) were found to prevent the absorption of carcinogens in the gut. To examine the effect of dietary chlorophyll on the development of tumors, an animal study was conducted, where the animals were administered with chlorophyll for a period of 4 weeks. IT was proved that chlorophyll could inhibit tumor growth and proliferation in an animal model, independent of the species. Chlorophyll, a major component of wheatgrass juice prevents cancer and also prevents the absorption of carcinogens (cancer causing substances) from the gut. Vitamin A has been known for its helpful role in the betterment of eyes, bone growth and skin. CRBP-1 is the protein that binds to vitamin A. The downregulation of this protein has been linked to more malignant phenotype nasopharyngeal, ovarian as well as breast cancers. However, re-expression of this protein has been found to reduce the viability of ovarian cancer cells in vitro. Though it is not an anticancer agent, vitamin A can still be beneficial in case of cancer. Methylcobalamin is a form of vitamin B12. It has been known to inhibit the proliferation of malignant cells, such as those cloned from the mammary tumor in mouse, especially those dependent on androgens or estrogen as they are sensitive to them. It also had anti-proliferative effect on cell lines such as SC115 and B-1F cells that have the ability to form tumors. It leads to apoptosis of cells in the mammary tumor cell line cloned from mouse. Very well known for its antioxidative potential, vitamin C also helps with cancer. Vitamin C can produce high urine and plasma concentrations that may possess antitumor characteristics. It has been shown to have toxic effects against tumors. It has the capability to selectively kill tumour cells. It mimics the activity of cytotoxic chemotherapeutic agents. Whether vitamin C is taken orally or intravenous administration is carried out, high doses of vitamin C can be potentially toxic to cancer cells. Vitamin K also has anti-cancer potential as it leads to cell death and cell cycle arrest of cells that could be malignant. It also has apoptosis-inducing activity, just like vitamin C.
Vitamin A reduces viability of ovarian cancer cells, Vitamin B12 can be used for the treatment of some malignant tumors, vitamin C can be toxic to cancer cells and induce apoptosis in tumor cell lines just like vitamin K. Hence wheatgrass juice is very beneficial for cancer patients. Wheatgrass is also a good source of selenium. Selenium has the capacity to make cancerous cells undergo apoptosis. It enhances the immune system and leads to the formation of natural killer cells, it also decreases the rate at which tumors proliferate. According to a study, patients with a history of squamous cell or basal cell carcinomas took selenium orally (200 micrograms) each day. There were no cases of selenium toxicity and selenium consumption reduced the mortality from and also the reduced the incidence of carcinomas of several sites. Selenium administration has also reduced prostate and total cancer incidences. It also had a protective effect on males, especially smokers. Wheatgrass contains selenium which decreases proliferation rates of tumors, and also reduces incidences or mortality due to cancer. A dose of wheatgrass can range from 3 grams up to 6 grams per day. It can be taken on an empty stomach for maximum benefits and food and drinks must be avoided for an hour after consumption. The dose can be increased gradually, however one must not exceed 3 doses per day. Those intolerant to wheat must be careful before consuming wheatgrass in any given form, such as juice, tablets or pellets, as it may trigger allergic reactions. Wheatgrass can also be susceptible to molds, due to which fungicides are used on it. Due to this, it may become toxic if consumed as both the substances are harmful to humans. Wheatgrass can also cause nausea due to the bacteria and spores on it if it grows in unnatural conditions. Wheatgrass can be an excellent supplement for those who feel that they are susceptible to cancer. It can prove to be toxic against cancer cells and also inhibits tumour proliferation. It also has a number of other health benefits, prevents anemia and also keeps the heart healthy. However, before using it, one must keep in mind allergic reactions and hypersensitivity to the wheat plant.